Last week some of you may remember I posted this circling prayer meditation. One person commented: In a busy place draw a circle around you with your finger and envision God enfolding you in a cloak , ask God for peace to hear him . I have spent the whole week doing just that – not just for busy places but also for stressful and challenging places. And there have been many stressful places this week. I am entering my last week as Executive Director of Mustard Seed Associates and though the transition to Andy Wade’s leadership could not have gone more smoothly, it is still stressful… for both of us, as we try to juggle all the details that such a transition encompasses. Fortunately, as Andy keeps reminding me, I am not going far and will continue to advise and contribute to Godspace. Even more helpful for me has been an exercise to move my circles from the imaginary to the real. I didn’t use a cloak, but instead grabbed a piece of construction paper and some of my rock collection and made a circle. I sat for several minutes contemplating my circle and reminding myself of all the attributes of God I wanted that circle to embrace. I wrote those around the inside, added the words circle us Lord, and envisioned that enfolding cloak of God around me. then outside the circle I wrote the attributes I would like to see excluded from God’s enfolding cloak. It was so comforting and strengthening. As I continued to meditate on my circle, a heart shaped rock I acquired recently caught my eye and I knew it had to be added to the centre. God’s loving heart is at the centre of my circle. God’s loving heart is where life and light, hope and joy abide. The finished “work of art” sits on my desk as a reminder of God’s embracing presence. It is a wonderful way for me to recentre my soul and my spirit each morning. It has already inspired the creation of the prayer above and I suspect will inspire other creations in the future. 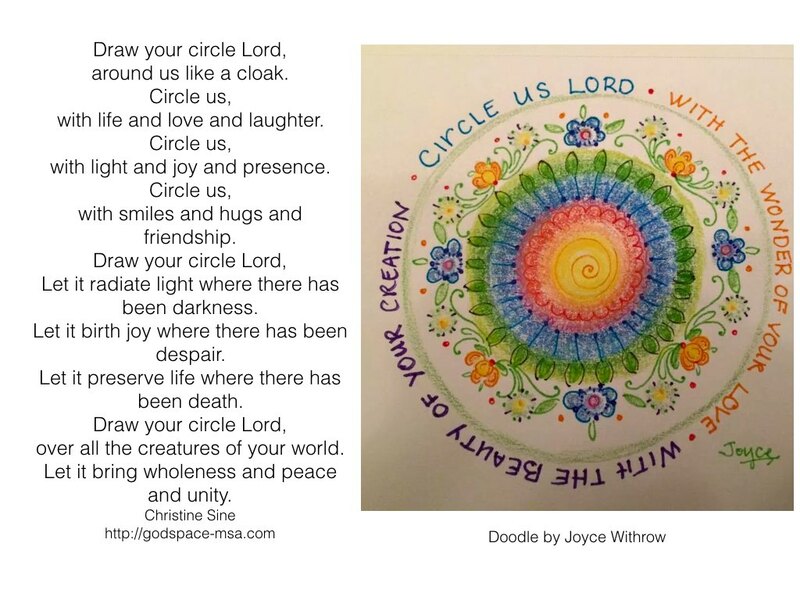 When I posted a meditation on circling prayers in January this year, I received several responses from people who were inspired to use their own creative medium to respond – like Joyce Withrow who created the doodle above. I invite you too to respond in the way that seems most appropriate for you. What is the creative activity that most inspires you? Perhaps you like to doodle, or knit, or paint. Or you might prefer to garden, or go running or draw on a sandy beach. Or perhaps you like to sing or compose music. All of these creative exercises can be used to craft images that reflect the encircling embrace of God. Gather your materials. Sit quietly for a few moments with your eyes closed. Listen to the video below. Repeat the words circle me Lord aloud several times. Draw an imaginary circle and picture God enfolding you in a cloak. What images come to mind? Express those with your creative gifts.